Hydroponic gardening is the latest and among the most innovative form of growing plants. Some time ago, no one would have believed if you told them that it was possible to grow plants without soil. But how is it then possible now? Well, the principle idea is having a water nutrient solution that replaces the role of fertile soil in helping the plants grow healthy. You may have heard something like the Deep Water Culture and the wick system – all forms of hydroponics. A plant’s root system needs air, or it would choke and die. In a hydroponic system, the best air stones and air pump ensure plants get a fair share of air they need to thrive. 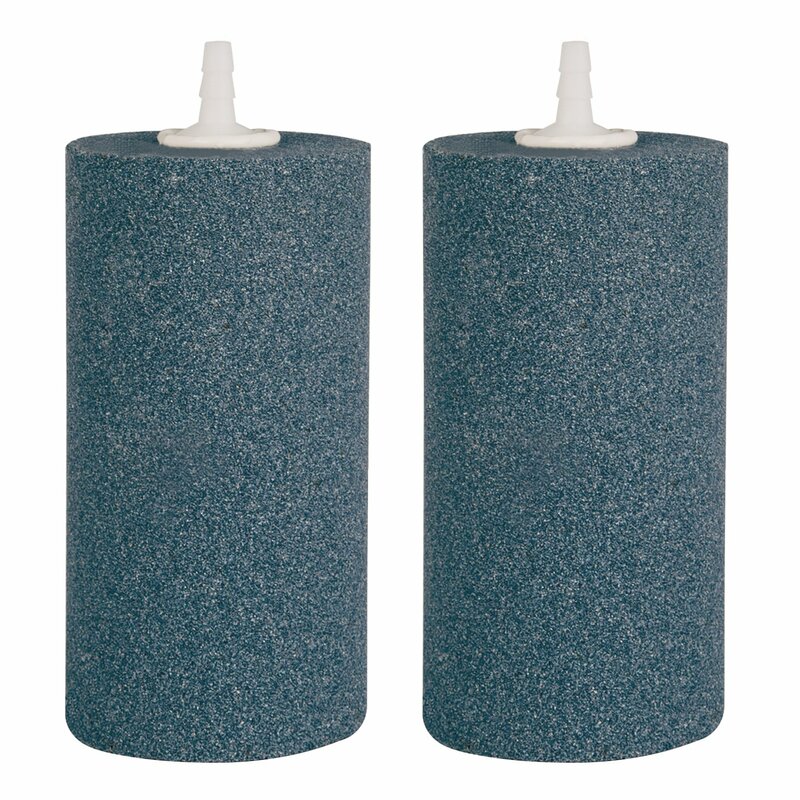 Aquatix Pro Air Stone Large Premium 4"
1 Why is Air Stone Necessary in DWC Hydroponic Gardening? 3 How do Air Stones Function? Apparently, three are always better than one – or what do they say? Aquatix Pro Air Stone Large Premium 4″ is a pack of three stones of premium quality to offer the best of services. The air stone is disc-shaped providing an optimum surface area for the diffusion of air – the shape is quite functional. And the stone is quite versatile in a sense since you can use it in various places such as ponds and aquariums, you name them. This coke can-shaped air stone is not only appealing and easier to handle but is designed to provide an optimum level of oxygen and support nutrient circulation – quite something! Vivosun is an authority when it comes to agricultural products, and so you are assured of quality. Far from that, the air stone is thick enough to provide a long-term of service. With a jetting volume of 1.3 L/min and easily driven by nano pumps, this air stone is probably one of the best you can get for your hydroponic gardening. Pawfly Air Stone Cylinder Bubble Diffuser Airstones come as a package of ten air stones – enough to provide you a long-term service. However, you will need an air pump of more than 2.5W for them to work effectively. These blue-colored mineral stones are disc-shaped for efficient air production. It is heavy enough to stay where you need it and perform its task effectively. And with a good pump, this air stone produces a decent amount of bubbles to keep the water aerated and turned effectively – it’s just what your plants needed. This stone comes in a unique shape that is easy to identify among others. The product has a very porous surface for efficiency in air diffusion. Air production is also pretty consistent – ideal for the fishes and hydroponics. It comes with a full-size stem for effective tubing – you will not need to drill holes. This means that there’s pretty of space for water flow ensuring effective diffusion. 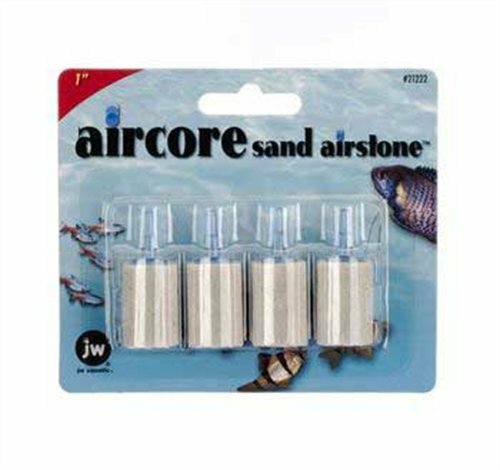 Why is Air Stone Necessary in DWC Hydroponic Gardening? Air stones are quite common especially among people that have aquariums. However, they have gradually found some use among hydroponic gardeners. But is it vital to have air stone supply air to the plants, root system? You can still utilize other ways to supply air to the tank. However, air stones are believed to enhance air diffusion. Air stone is easy to use, quiet and produce oxygen efficiently. Deep Water Culture (DWC) is among the most straightforward and practical form of hydroponic gardening. Typically, a plant’s roots are dipped in nutrient water solution in the reservoir. Air stones connected to special pumps then supply the plant with the appropriate oxygen. For adequate growth, plants demand a sufficient amount of oxygen. But the question is, how much is sufficient? What happens when there is little or more of in the nutrient solution? Ideally, 100 Liter Per Minute (LPM) of oxygen is enough for 100 gallons of nutrient solution. This translates to about a liter every minute for a gallon of solution. Too little would cause growth problems and reduced production – this is not what you want. An excess amount of it is not also right – you know what they say about too much of anything? Excess oxygen production can cause heat and affect a plant’s growth process while encouraging the growth of algae. How do Air Stones Function? The best air stones break air into small bubbles that travel through the attached tubes to the reservoir. The smaller the air bubbles, the better the air conductivity, and the better the diffusion. Plants benefit more when the bubbles are smaller as they diffuse readily in water where the roots system picks it up. Just as there are different products from different manufacturers – it’s a free market out there, literally – there is quite a large variety of air stones. The following are the most common and best airstones you can get for your hydroponics. The name of the air stone provides a clue as to how the air stone looks like – but it’s not golden, of course. They are pretty standard in aquariums, and you may have come across one fizzling some bubbles for the pet fish. 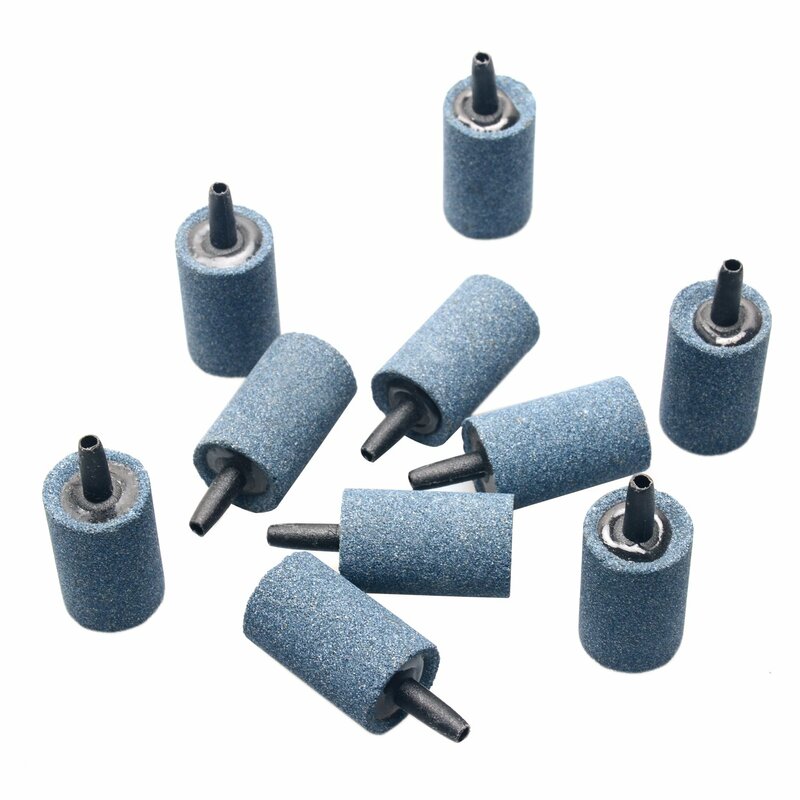 The stone has about 25 mm diameter and is sufficient for an air pump of 5LPM. This comes in a flat round shape, and it is made from the ceramic compound making them among the most durable. Its shape and surface area allows the disc to distribute more excellent bubbles, adequate for larger tanks. The air flow capacity of this air stone is between 2.5 and 10 LPM – suitable for most hydroponic gardening. The cylinder air stone – another name for the coke can air stone – is perfect for large reservoirs. This air stone is ideal for tanks that demand an air flow of between 5 and 10 LPM. The product produces a blend of small and big air bubbles as a result of its cylindrical shape. There’s often some confusion, especially among new hydroponic gardeners, as to the ideal spot to place the air stone for optimal oxygen diffusion. Well, the thinking of some is that suspending the air stone is perfect, but nothing could be further from the truth. The best spot for your air stone is at the deepest end of your reservoir or tank – simply, at the bottom. This allows some distance for optimum level diffusion to the delight of the plants. At the bottom of the tank, the air stone successfully gives off oxygen and has a chance to mix optimally with the water. Furthermore, placing the air stone at the bottom allows the nutrients opportunity to mix with the water. The bubbling and the sufficient space in between enable diffusion and mixing of air, nutrients, and water, all which leads to more plant produce. Hydroponic gardening is the now the ‘in thing,’ and more people are venturing into it – it is associated with a reasonable rate of harvest for the gardener to smile all the way. However, the root system needs a good flow of oxygen. 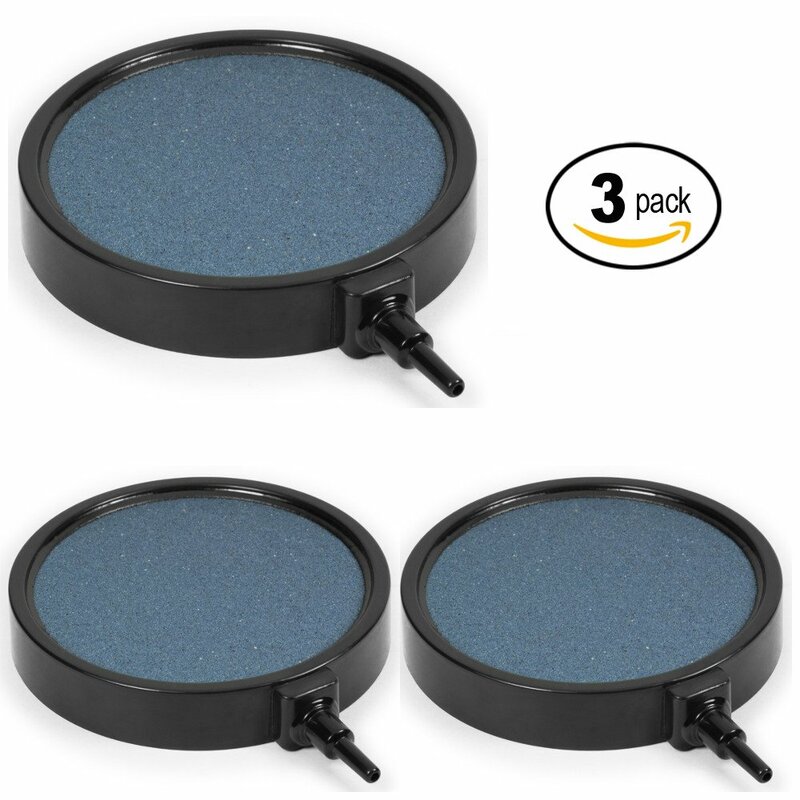 The best air stone to ensure a decent amount of air diffusion from the air pump makes sure that the plants are getting their fair share of oxygen. Any choice above will serve you well. However, our top choice is Aquatix Pro Air Stone Large Premium 4″. 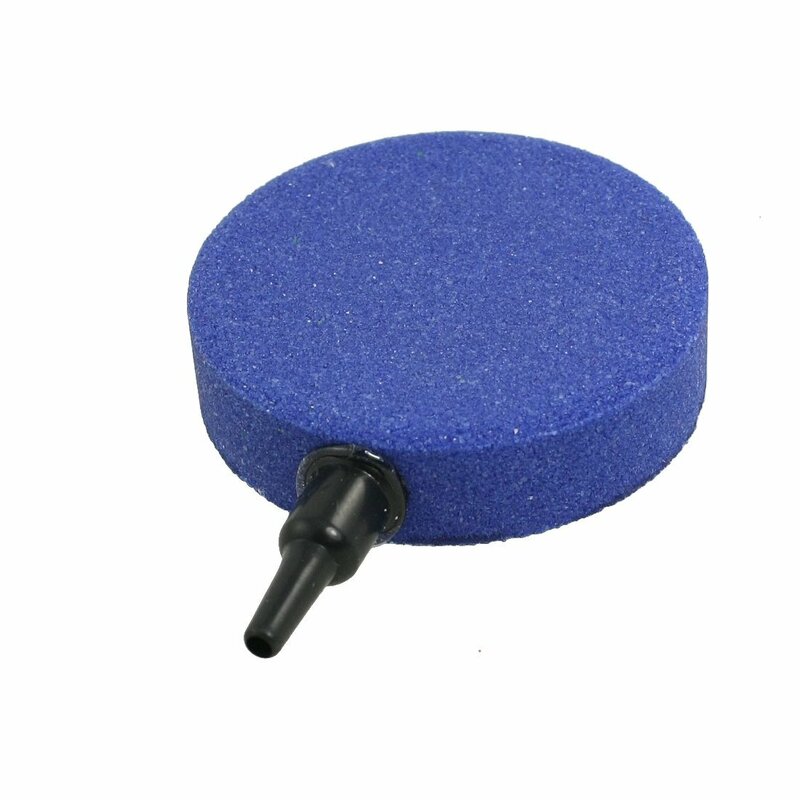 The 4-inch long disc-shaped stone gives off a considerable number of air bubbles from the air pump. It is durable and also ensures a decent circulation of nutrients to ensure your hydroponics are as healthy as can be – the ideal.